These fools still haven’t clued in to McMahon’s tactics. Hasn’t it registered with them yet that McMahon pulled the same crap on the old board who decided to proceed with our own water treatment system because KIP never produced anything? The only thing KIP has is lots of excuses. Remember the announcement at the July 27, 2017 meeting when the board said they had reached an agreement with KIP but McMahon hadn’t signed yet due to a family emergency IN JULY? Here we are Sept. 18, 2017 and guess what? McMahon still hasn’t signed – no surprise to those of us who have paid attention to McMahon’s track record. The board didn’t have an August meeting and now have postponed (how can it be postponed – it was canceled) as there has been NO PROGRESS. 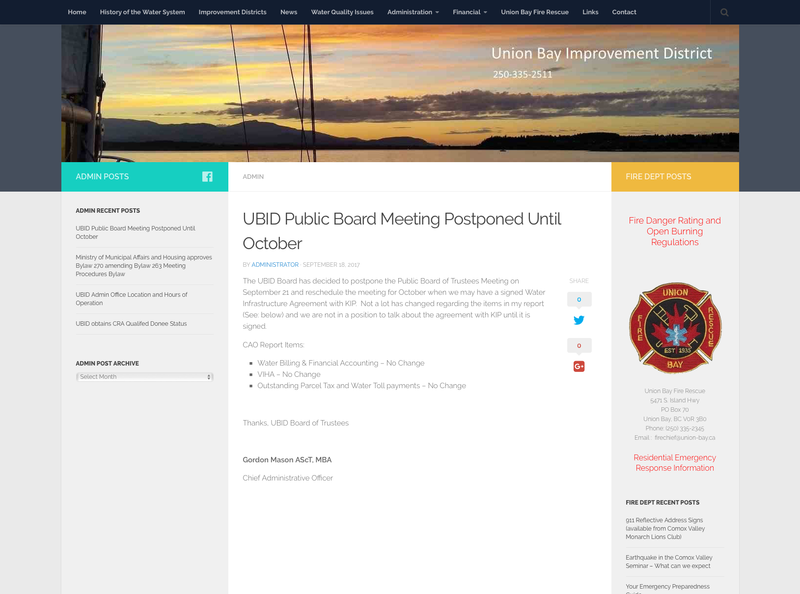 The UBID Board has decided to postpone the Public Board of Trustees Meeting on September 21 and reschedule the meeting for October when we may have a signed Water Infrastructure Agreement with KIP. Now they claim they’re not in a position to talk about the agreement until it is signed! What about the video clip below where they are discussing the agreement before it was signed! Not a lot has changed regarding the items in my report (See below) and we are not in a position to talk about the agreement with KIP until it is signed. Note it states “…in my report (See below)…” don’t bother as there are not active links leading to any reports. Typical. History repeats itself. This new batch of fools don’t realize they are being played by McMahon again. This is what this guy does. So this pro KIP heavy board has not accomplished anything in the last year – nothing. Next Post Food for Thought – Some comments on UBID In-Camera Minutes dated July 27, 2016 – Are UBID Trustees Working for the Community or for a Developer?